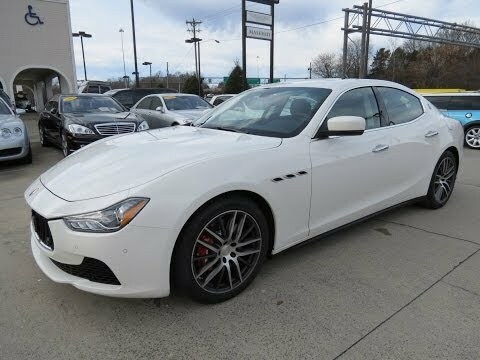 The 2014 Maserati Ghibli is the all-new premium Italian midsize sport sedan that fits below the larger Quattroporte sedan and is the most important car Maserati has built in decades. The stylish Ghibli comes in two trims for North America: the rear-drive Ghibli and the all-wheel-drive Ghibli S Q4. If you are tired of seeing buyers of premium midsize sedans bringing home one of the Germans (Audi A6, BMW 5 Series, Mercedes-Benz E-Class) and you desire real flair and a spirited drive for four adults (though it's technically a 5-seater), while having ample room inside and unique personalization options, then shop the 2014 Maserati Ghibli. The Ghibli is a true sporting sedan, so if you want a super-soft and sophisticated adaptive suspension and total silence in the cabin, you may want something else. The fun, new twin-turbo V6 engine is less fuel efficient than you might like at 14 mpg city and 23 mpg highway. Essentially everything about the 2014 Maserati Ghibli sedan lineup is new, from the chassis itself to the Ferrari-built 3.0-liter V6 twin-turbocharged engine, to every aluminum body panel. The adaptable 8-speed automatic transmission is of the latest German technology. Only the classy interior theme is familiar. Inside the 2014 Ghibli sedan the atmosphere is spacious and very Italian. The standard leather interior is nicely detailed and assembled and rear passengers have room to relax. On the list of options is a luxurious Poltrona Frau leather interior. Personalization options include a range of six leather colors and five looks for the trim details - among them Radica, Ebano, and Carbonio, the first two of wood and the third of carbon fiber. Gripping the leather-covered steering wheel is a pleasure, though some of the plastic touch surfaces feel unusually cheap at various spots on the dash assembly. Personalized aesthetics are a big deal for Italian cars and their clients, and the Maserati Ghibli sedan can be ordered in eleven different colors from the catalogue - most at added cost. The stunning array of wheels available from Maserati (there are seven) ranges from a standard 18-inch to an aggressive 21-inch forged design. Even the brake calipers from Brembo can be ordered in four different colors - black, red, blue, or silver. Exterior lines established by the new Maserati Quattroporte are faithfully echoed here in smaller scale on the Ghibli and look better at this size. The Maserati Ghibli (GEE-blee with a hard "g" as in "guts"), emphasizes the "sport" in sport sedan, whether driving the 345-horsepower Ghibli or top S Q4 version. The structural rigidity of the latest Maserati helps the car's handling, as does the choice to remain with traditional hydraulic steering instead of making the switch to electrical steering. Most of our testing was done driving the Maserati Ghibli S Q4 with 404 horsepower and even more torque to help acceleration to 60 mph happen in just 4.7 seconds or less. The Q4 all-wheel drive system is 100-percent rear-biased under normal conditions, sending traction to the front axle quickly on an as-needed basis. Press the Sport button on the center dash and gearshifts and throttle response get crisper, while it also opens up the sport exhaust, which makes a great sound. Standard on all Ghibli sedans is a mechanical limited-slip rear differential, a major badge of honor for a sporting car. The 2014 Maserati Ghibli has a starting Manufacturer's Suggested Retail Price (MSRP) of about $67,000 for the rear-wheel-drive base model tuned specifically for North America to 345 horsepower. The top S Q4 all-wheel-drive version of the Maserati sedan starts near $77,000. Both trims come relatively loaded versus several of their competitors in the segment. A truly crazy-full load of extras on the S Q4, however, can bring the price up over $95,000. With Maserati throwing almost all it has into the Ghibli but the kitchen sink, the option-list heavy Germans (Audi A6, BMW 5 Series, Mercedes-Benz E-Class) are able to have lower MSRPs by up to $15,000 before adding on the extras. The Japanese - like the Infiniti M range - likewise undercut the Italian. This would be fine if Maseratis had a tendency to hold onto more residual value over time than those competitors, but the market has routinely proven the contrary. Before buying, check the KBB.com Fair Purchase Price to see what others in your area are paying. As a benefit of the Italians often feeling that loading the car with content helps them better compete, even the base Ghibli for North America does well on standard equipment. All trims come standard with a mechanical limited-slip rear differential and a solid set of Brembo compound brake discs. Inside, passengers will always be surrounded by some form of all-leather interior, while the S Q4 comes with a large sunroof. All turbocharged 3.0-liter V6 gasoline engines for the Ghibli are based off of the Chrysler Pentastar V6 blueprint and modified extensively. An onboard computer interface and heated front seats are standard. Significant options for the Maserati Ghibli range start with the aesthetic personalization list, which includes multiple exterior colors, interior leathers (2-tone treatments also available), trim details, wheel selections, and even brake caliper colors. The $1,770 sunroof is an option on the base Ghibli. Performance wise, the biggest choice to make is the optional Skyhook adaptive suspension. For the S Q4 sedan there is the stereophonic choice of a Bowers & Wilkins hi-fi system. The Ghibli uses aluminum in the chassis structure and for various body panels, helping contain the overall weight and adding stiffness. The drive dynamics on the Ghibli benefit enormously from this. Aluminum in the crash structure helped the Maserati Ghibli achieve 5-star Top Safety Pick status in IIHS testing. The 2014 Maserati Ghibli is as large as the Audi A7 but competes with the Audi A6 and Lexus GS. Being five inches longer than the GS gives passengers in the Ghibli sedan noticeably more space to stretch out and enjoy the Italian cabin. Cargo space is 18.7 cubic feet. Using the Chrysler Pentastar 3.0-liter engine block and head as starting point, the Maserati Ghibli sedan benefits from the two separate power ratings of a twin-turbocharged powerplant built by Ferrari in Maranello. Whether at 345-hp or 404-hp trim, the responsiveness via the very sweet-shifting 8-speed automatic gearbox is satisfying, and the voice of the sport exhaust likewise. The powerplants are sadly not yet direct-injected and so their fuel efficiency - using regular unleaded - is not stellar as it should be. With the responsibility of the Ghibli sedan to produce maximum sales, Maserati will later come out with hybrid-EV trims, a GT S trim and/or an ultra-aggressive MC Stradale version. A first-ever 3.0-liter turbocharged Ghibli diesel is offered in Europe. The 2014 Maserati Ghibli is the 3rd-generation of the model, but it's been 17 years since the last one, and this new smaller Maserati comes only as a 4-door sedan. As with past Maseratis, the Ghibli is the clear sporting leader in this segment given its suspension settings and power delivery. The chassis architecture under the Ghibli sport sedan is also all-new and the drive performance is precise and enjoyable. For North America, the stylish Ghibli comes in two trims: the rear-drive Ghibli and the all-wheel-drive Ghibli S Q4. No one really needs an Italian luxury sedan, what with all the good premium Japanese and Germans, but many desire one. And the 2014 Maserati Ghibli stands apart from the crowd. Awesome car to own and drive anyplace. Reliable and fun to drive; a pleasure every time we get into it and would not want any other car. Performance is awesome and the exhaust note is hard to believe. To own a car with this heritage is truly great and unlike any other. Most people who see it just love it and tell us how lucky we are.